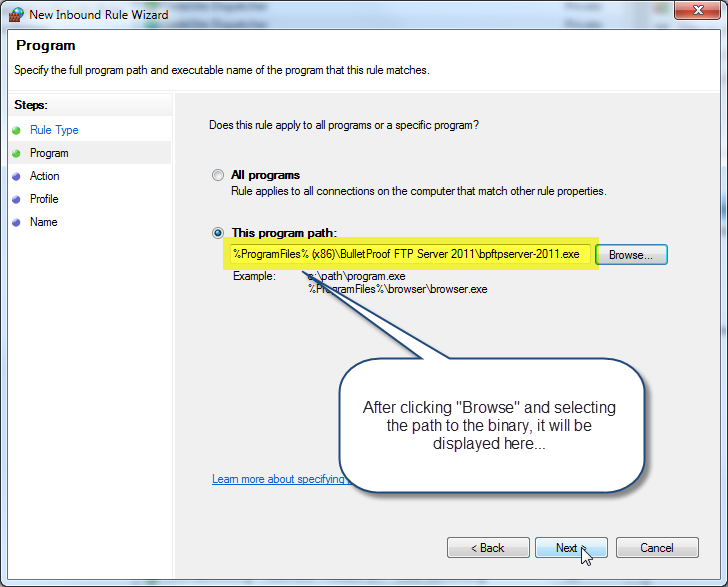 Q: We are running an older version of BulletProof FTP Server. If we upgrade to your latest version, will our configuration/user list/etc. transfer from our old version? 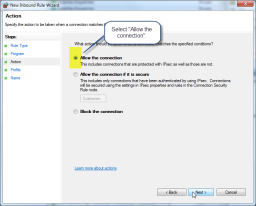 Q: Can I backup the Settings, Users and Groups? 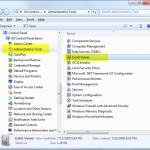 Q: Can BulletProof FTP Server run as a Windows System-Service? 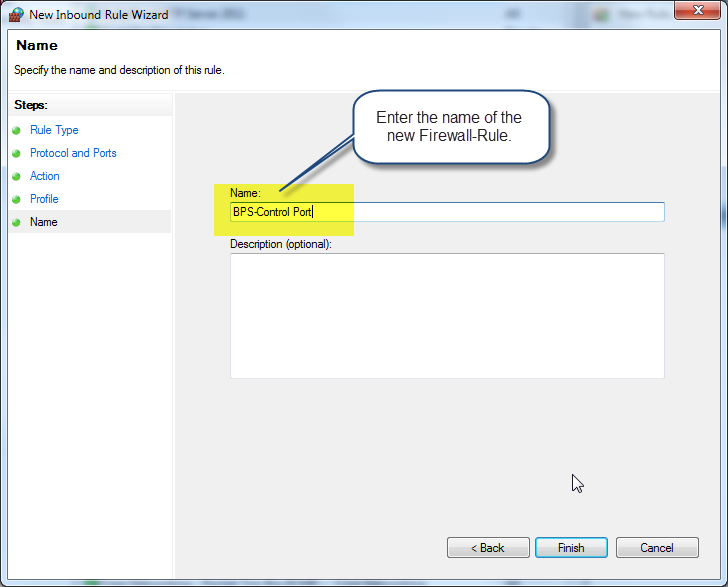 Q: My customers can’t login to BPFTP Server! 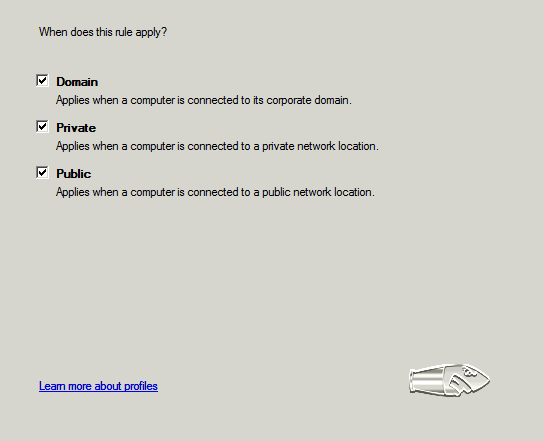 Q: My customers can login, but they can’t get a directory-listing! Q: Do I get a discount for upgrading or renewing my previous order? 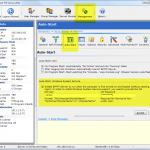 Q: I purchased BulletProof FTP Server a few years ago and I lost my key. Can you resend it? A: YES! Absolutely. 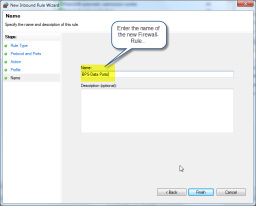 Everything is stored in INI files (settings, users, groups, etc), when the current version of the software is installed; it will go out and look for these files in the default locations for previous versions. 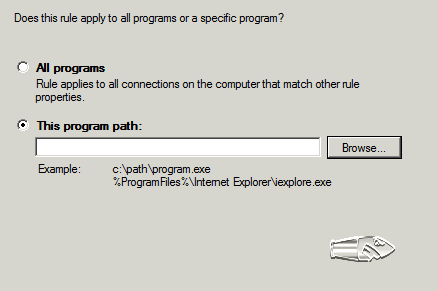 If anything is found, the program will prompt you and ask if it’s ok to migrate these files to the current version. 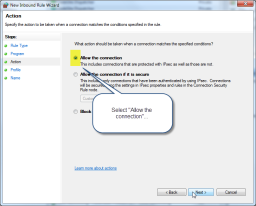 FAQ: Can I Upgrade and retail all my Users, Groups and Settings? 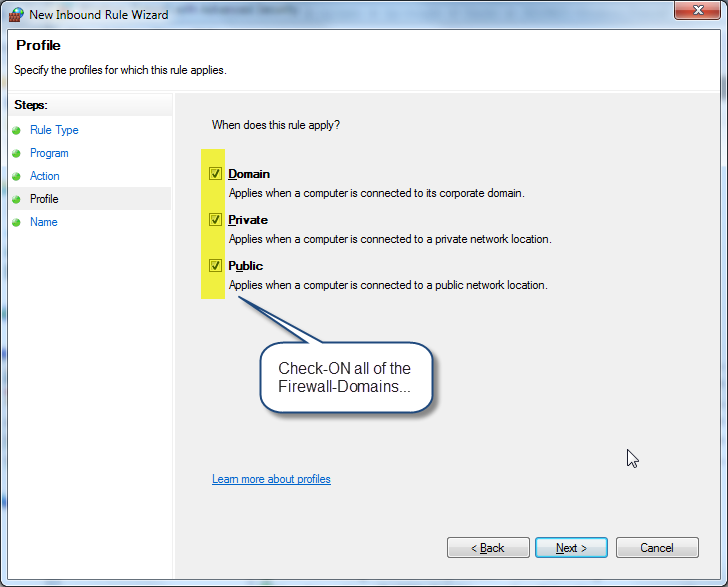 A: The machine is most likely firewalled. This means there’s a physical-device which is acting as a firewall (aka NAT/Firewall/Router/WiFi,etc) and/or Windows Firewall and/or (some other) Internet Security that is protecting the computer. A: YES! You can get the discount coupon-code and instructions from our website under the Members section of our website (see below) or you can email us with the customer information used on the previous order and we can send it directly to you. A: PERHAPS: First, we need you to send the customer information for the previous order. 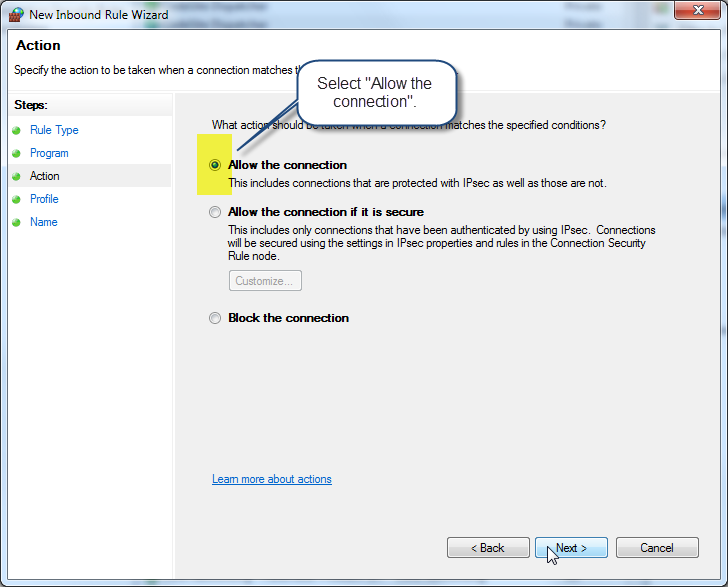 This will allow us to look it up and see what length of Update/Support Protection with Download Locker was purchased. If it’s within the period you purchased, we can quickly issue a new key and send it to you. If it’s expired, then we can send you a discount coupon-code for renewal. You can see all of your orders and the Update/Support Protection with Download Locker by logging into the Members section of our website. If the term is expired, you an also get a coupon-code for renewal in this same location. If you are having troubles logging into the Members section of the website, please Contact Us and include your question and customer-information used on the previous order. 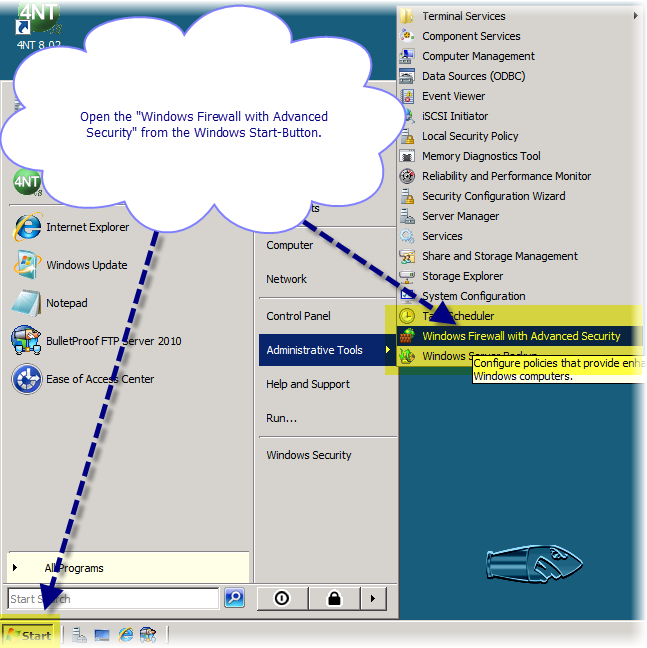 BulletProof FTP Server 2011 can also run as a Windows System-Sevice, allowing you to serve up ftp-content from your computer without having to login to the system. 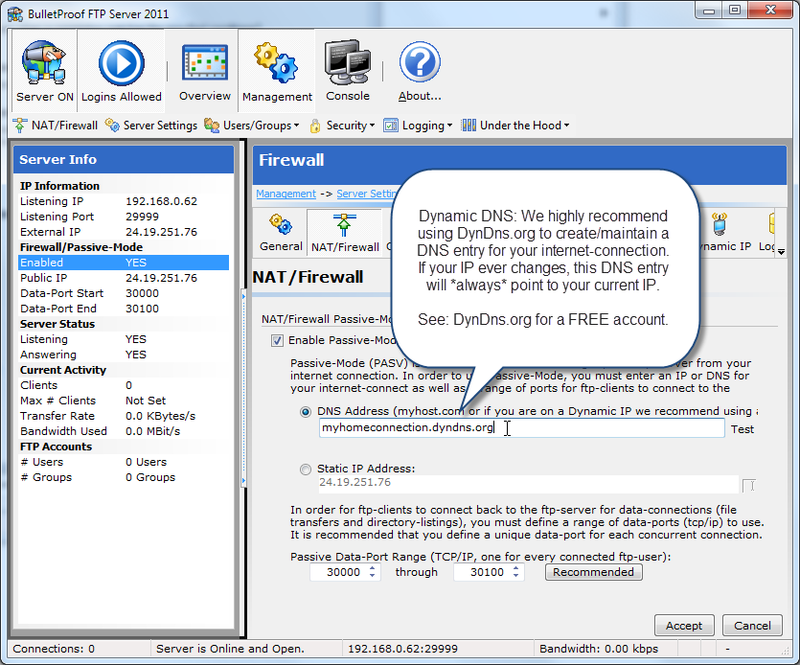 This is a very handy feature for businesses that rely upon a FTP-Server to communicate with customers, receive files from automated processes or just-plain access your HOME computer from WORK. 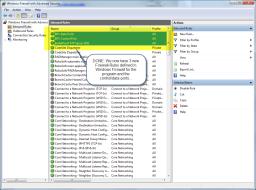 Setting up Windows System-Service Support is very easy, but it does mean a little-bit of leg work on your end to satisfy Microsoft Windows’ security. Click on a thumbnail to expand the image and see more information and instructions. Step #4: Click the “Log On” tab and make sure that the “This Account” is toggled and you can see the USER and PASSWORD values populated. First, thank you very much for upgrading to the CORP version! Your support helps to fund development and keep new versions coming out with the same pace of changing technology! 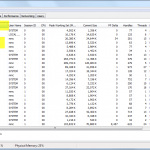 This GUIDE will help illustrate the steps to increase the amount of memory.. Many Thanks to AlexanderL for helping to discover a resolution to this problem! 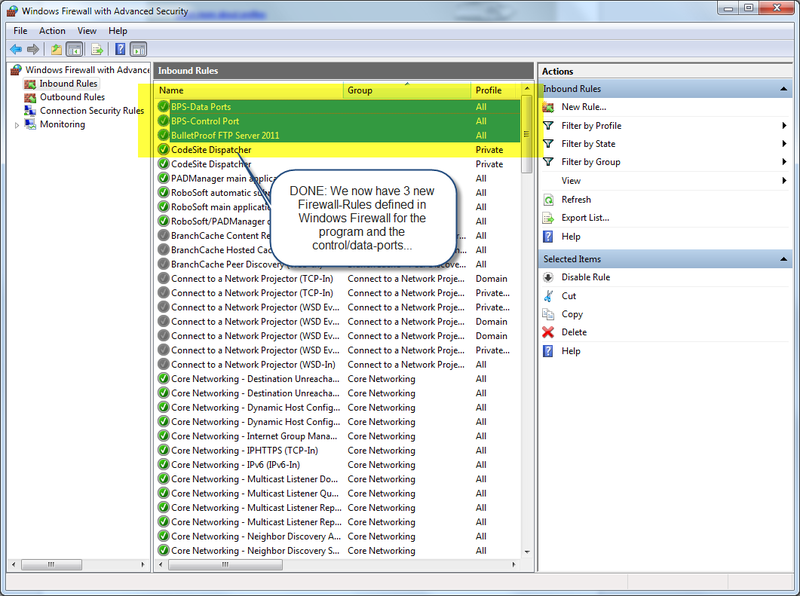 Microsoft is known to be one of the most security (gui) operating-systems on the ‘net. For us old salts, we know it certainly didn’t start that way. Over the last decade, Microsoft has made tremendous strides… but with that comes added levels of complications. 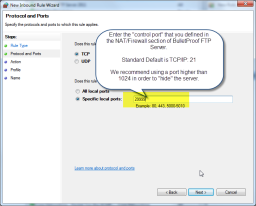 Take running BPFTP Server as a Windows-System-Service, one of the most common technical-support questions (second to Firewall settings )… It’s a complicated issue. 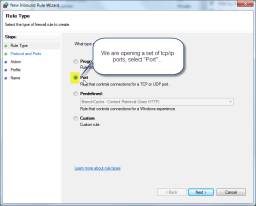 Which brings us to the permission “Logon as Service”… The magically permission that the OS-USER needs to have in Windows in order to run BulletProof FTP Server 2011 as a Windows System Service. 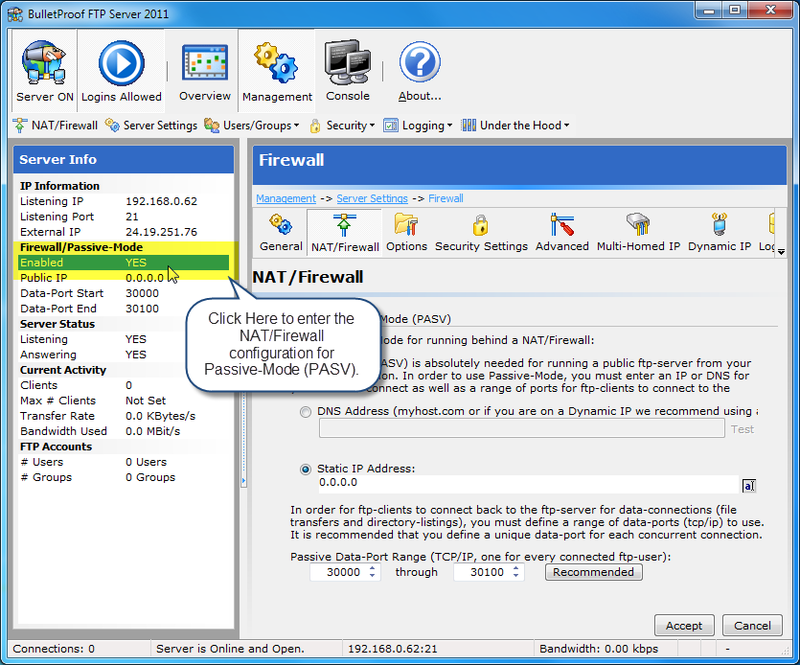 BulletProof FTP Server is an excellent FTP Server for Windows. 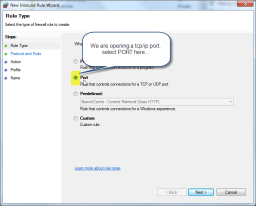 With the recent development efforts in v2011, we thought it would be a good time to introduce some of the command-line-switches (CLI) for managing BPFTP Server from external programs, web-sites, scripts, etc. 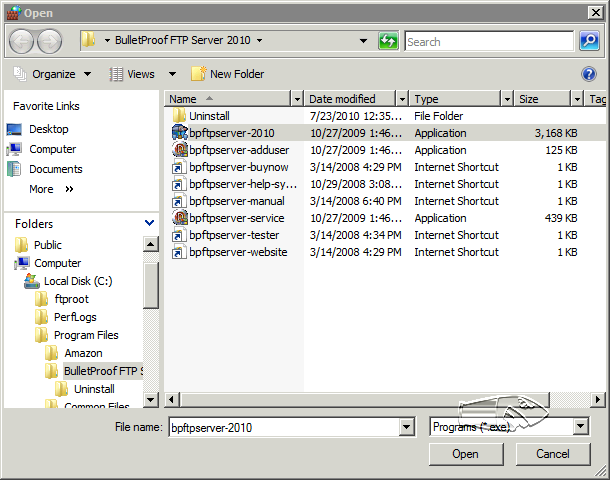 NOTE: At times you’ll see BulletProof FTP Server for Windows referred to as “BPS”. 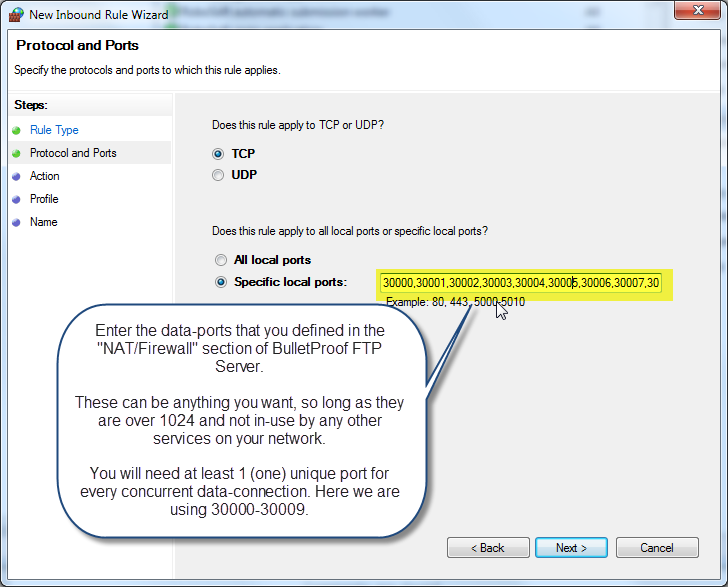 Will cause the running instance of BPS to reload the settings, users and group information. Take BPS online and ready for incoming connections. 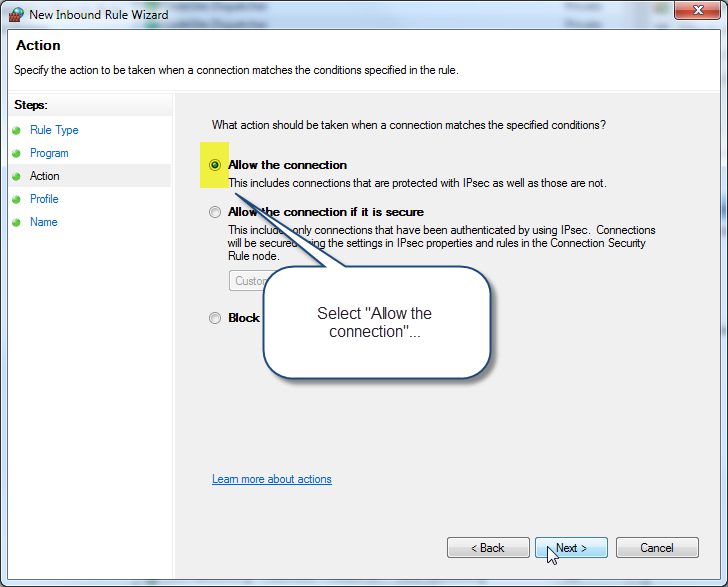 Take BPS offline and disable the listener from answering incoming connections. Terminate BPS and stop it’s execution on the system. All users will be forcibly disconnected. 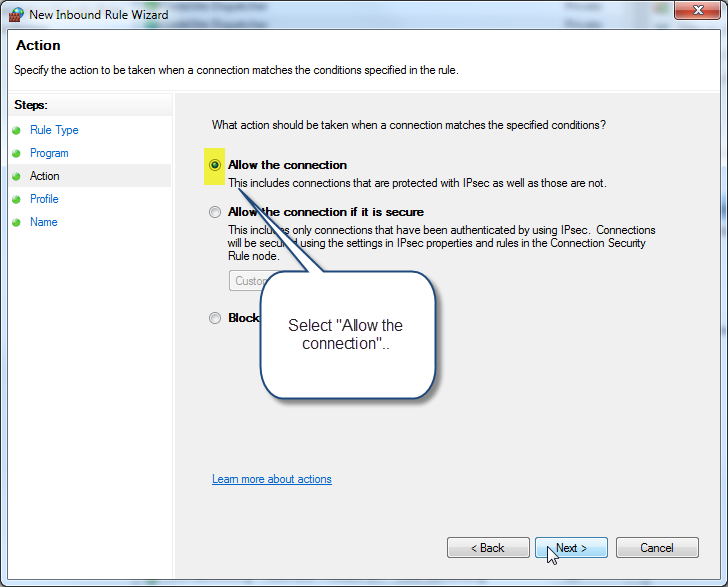 Keep BPS online and all active-connections maintain, but disable the listener; resuling in no *new* connections accepted. Renable the listener, allowing new connections to be accepted. 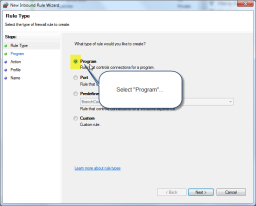 Start logging to the log-file defined in the software. 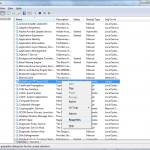 Stop logging to the log-file. Kick all currently connected users off of the server. 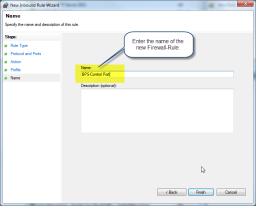 Regenerate the statistics files for users in the system. Copyright (c) 1998-2015 BulletProof Software LLC, All Rights Reserved. 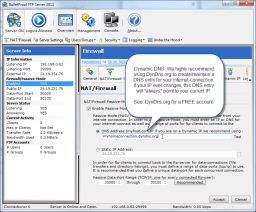 Command-line utility to manipulate the USER and GROUP database for BulletProof FTP Server. 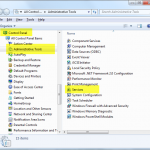 While initially confusing, there’s a difference between an “account-name” and the “login-name”. The account-name refers to a “user-friendly” name for the account, such as “upstairs accountant” and “log-name” is the actual login that used to access the ftp-server; such as “accountant”. 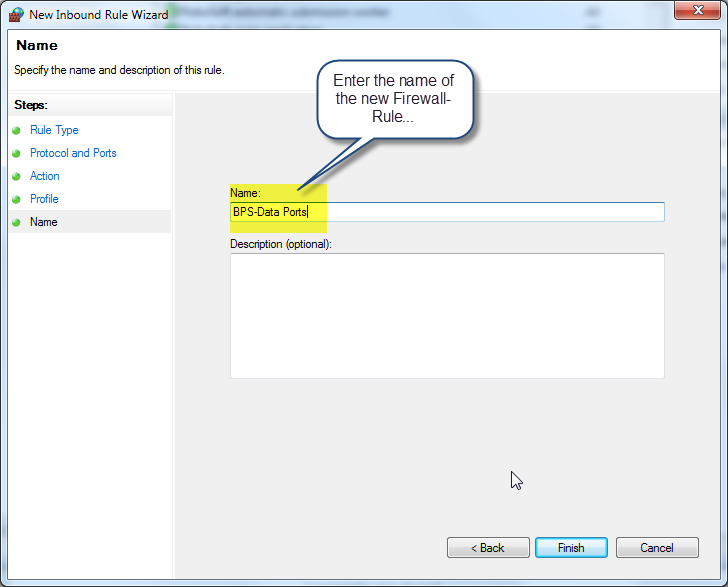 Will add an access-right for the account to the directory c:\ftproot\ with the privledges of (R)ead,(L)ist,(S)ubdir . 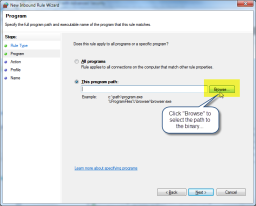 The first access-right specified will be the HOME-DIRECTORY for the user. 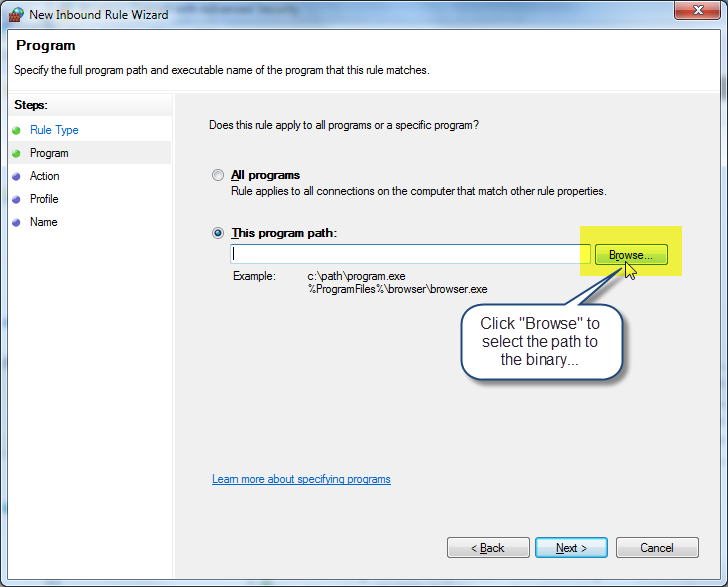 Additional access-rights can be defined by use the “-access” parameter again. If you are specifying a user-account that already exists, then all access-rights for the account will be deleted and given the access-rights that you define here. 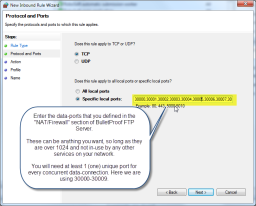 Great “Getting Started Guide” for BulletProof FTP Server.. the intention of the video is to get the product up an running with Yokogawa DAQMaster MW100; but it’s a great primer! NOTE: The version used in the video is 2010, but the UI is very familiar to 2011 and you won’t have a problem following it. 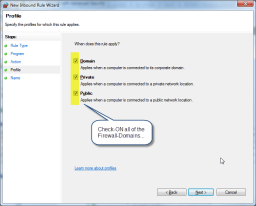 By default, the latest versions of Windows protects your computer with the Windows Firewall with Advanced Security, effectively blocking access to your computer from the internet and would-be hackers (Getting Started Guide). 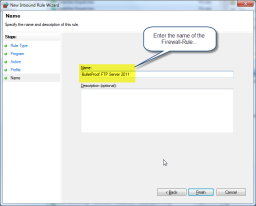 However, this also prevents ftp-clients from accessing your installation of BulletProof FTP Server 2011 unless you “open the firewall” to allow access. 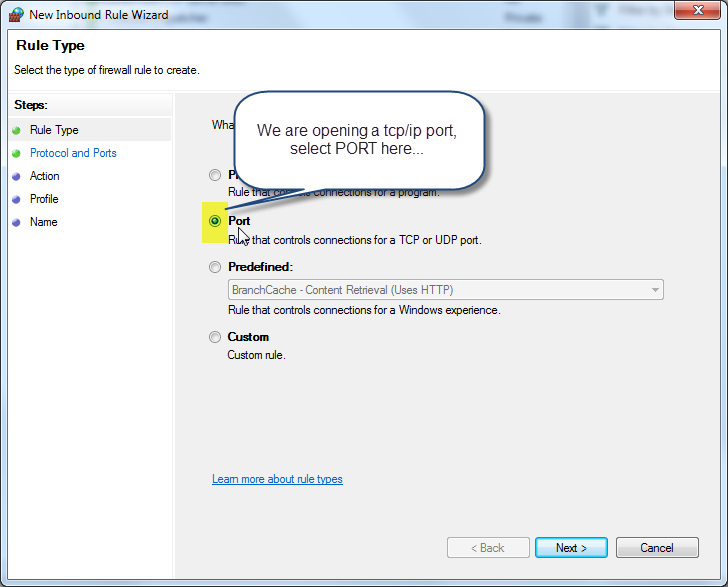 This means, you must open at least two ports; one for the control-connect and 1 (one) data-port for every concurrent connection to the ftp-server. 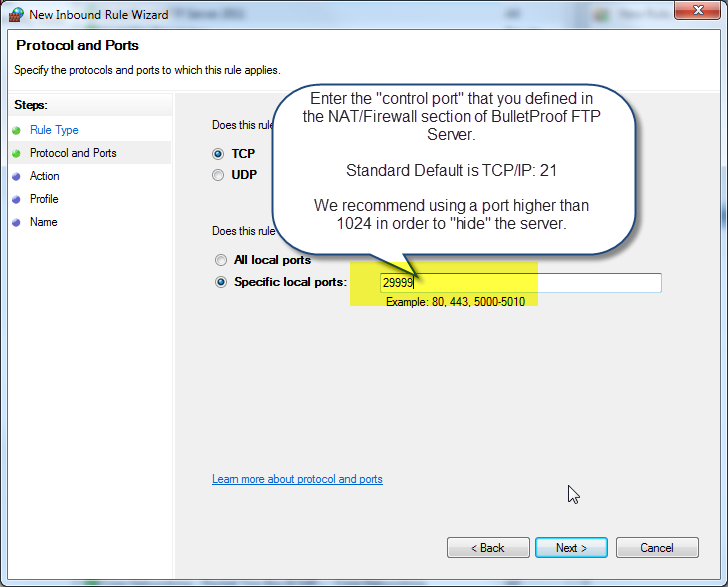 NOTE: It’s very common for people to think that only 1 (ONE) port is needed for FTP (default tcp/ip port 21). 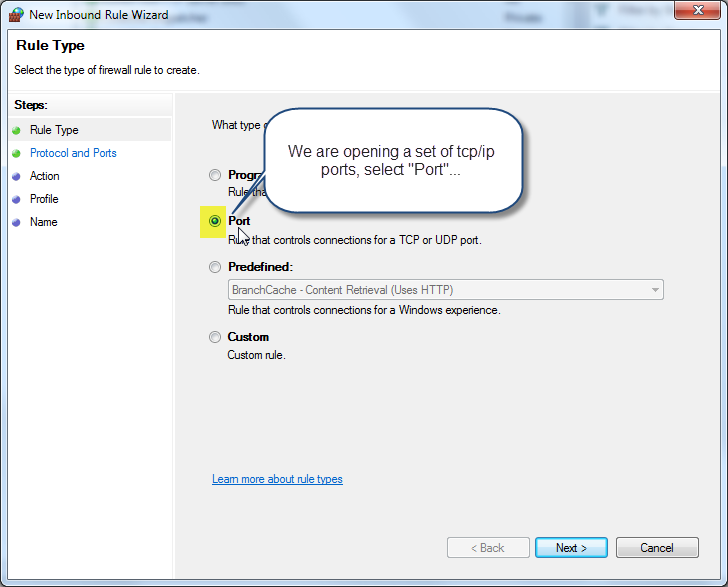 However, this is NOT the case as you need to define data-ports in order to support Passive-Mode (PASV). 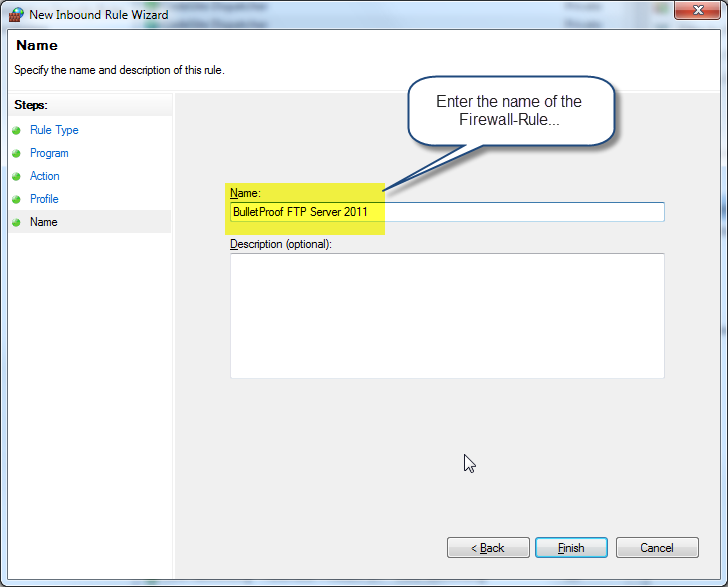 LASTLY: Be sure to run your installation through our Firewall Tester. 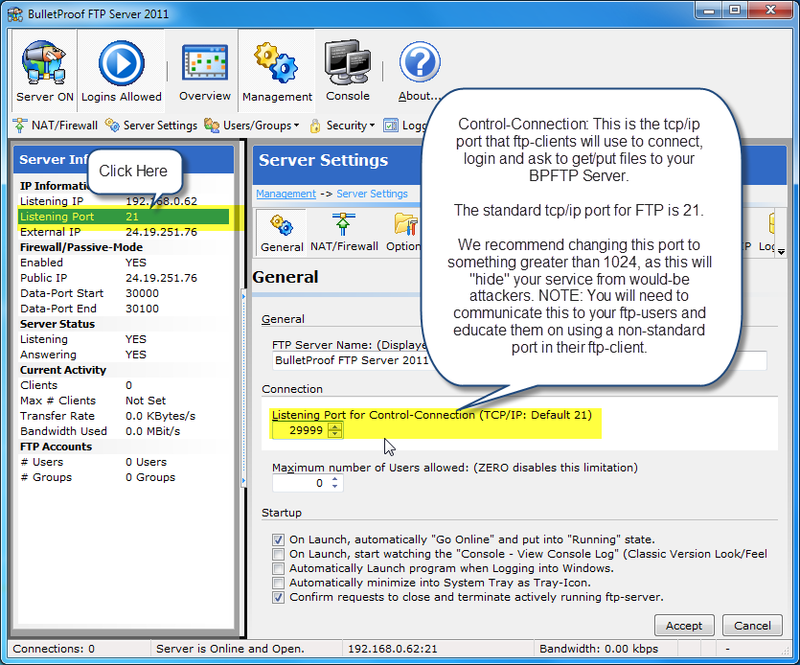 After providing the IP/Host, Port, User and Password for your installation, this tester will simulate a ftp-user can connect to your BPFTP Server. Please use it! 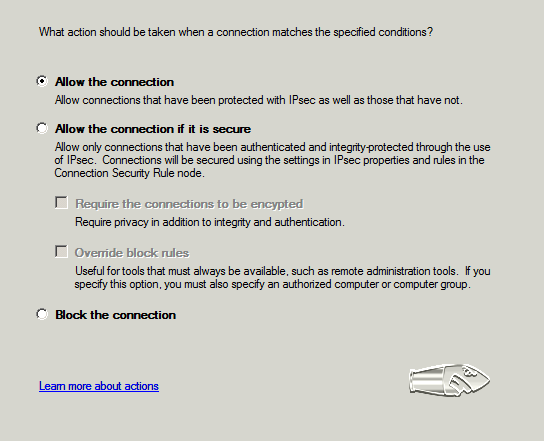 NOTE: If you are running any Anti-Virus or Internet-Security software on your computer (McAfee, Norton, etc) you may also be protected by yet-another-software-based-firewall. 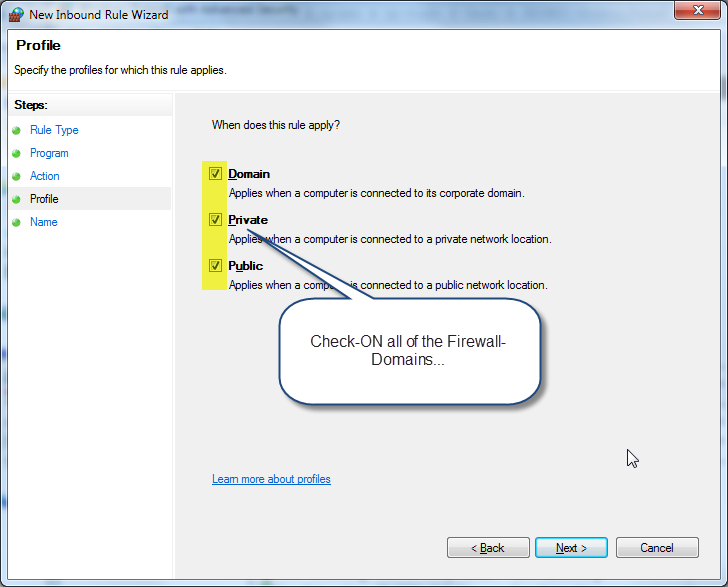 Please consult the documentation that came with your software for opening up firewall-ports. 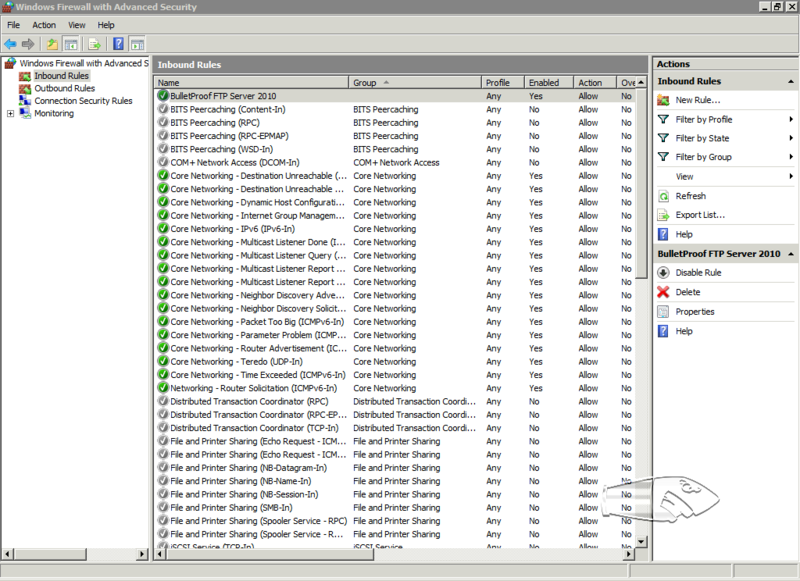 NOTE: Almost everyone has a hardware-based NAT/Firewall router in their network topology. For Home Users, this is usually your WiFi-Router. 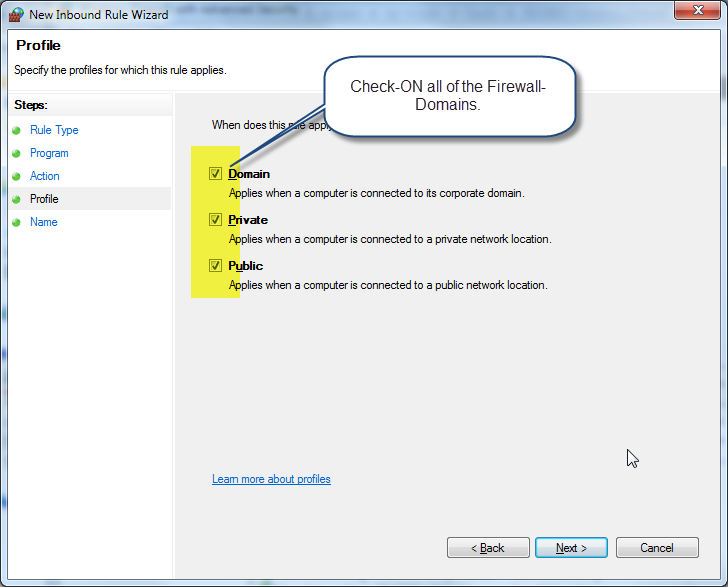 Please look into the documentation that came with your hard-based NAT/Firewall router for information on opening firewall-ports. 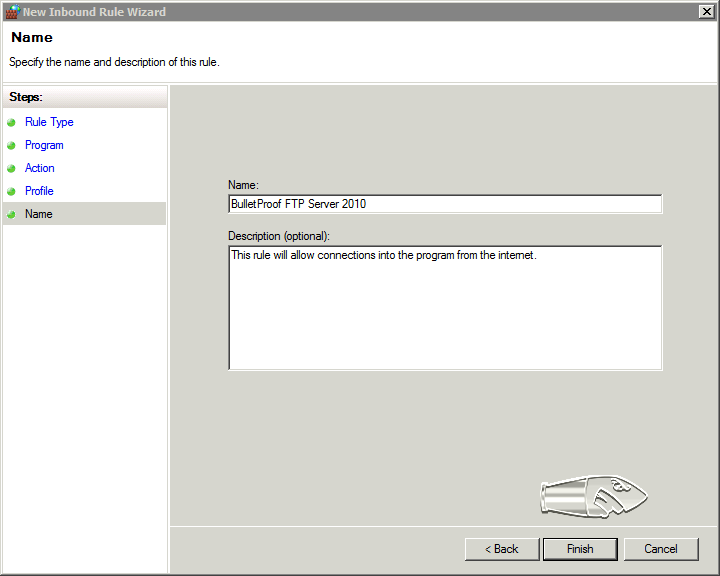 Today, we are proud to announce a new release of our BulletProof FTP Server for Windows 2011. We’ve looked at every bit of functionality in our previous award-winning version and rewritten it to be better, faster and more intuitive. We are very pleased with it and hope you will be too! We’ve also done our very best, to make sure this version is a simple upgrade to your previous version; by maintaining the same settings, users/groups and data-formats. 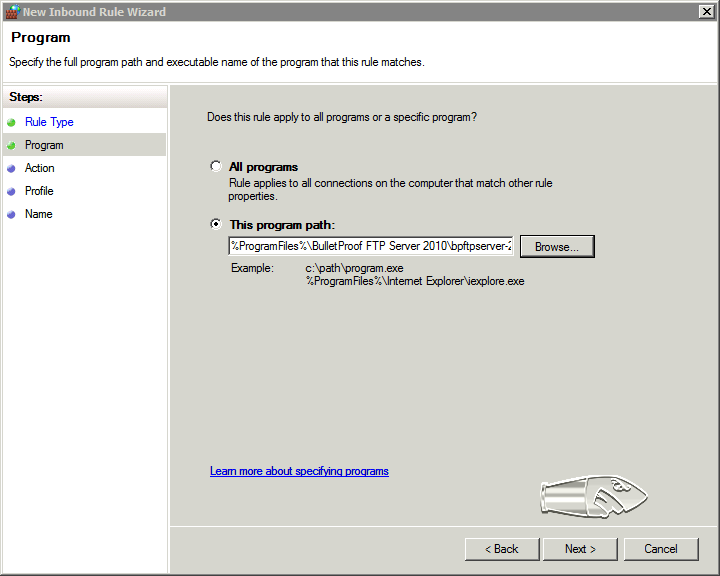 In addition, we’ve built an automatic migration utility that will aid in the upgrade to the latest version. Customers who’s support-entitlement has expired. Please contact us for a previous-customer discount. Scheduler: We’ve reworked the user-interface and fixed a few problems that prevented the proper execution and set-up of scheduled-events. 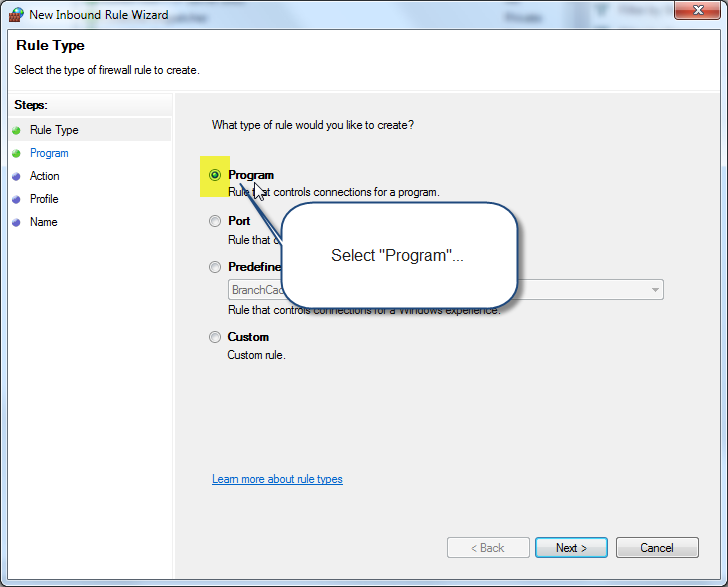 Users/Groups: The internal functions used to manage users/groups has been rewritten and a number of potential pitfalls in memory-management has been corrected. User-Interface: We’ve taken your input and made the user-interface faster, more streamlined and intuitive. 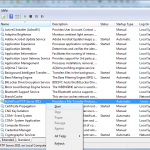 With better memory-management and the ability to size the icons and choose to see the “Console Log” on start-up. 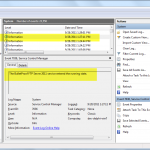 Windows System-Service: The support for running the software as a Windows System-Service has been rewritten to better support newer features found in Windows 7 and 2008; as well as reducing the memory-footprint by over 45%! Full Changelog: Got some time to kill and want to see the changes ad nauseam? See the full Changelog with over 65 feature-changes.